Richard Downer This Georgian property is in an outstanding location with open views over Dartmoor and the sea beyond. 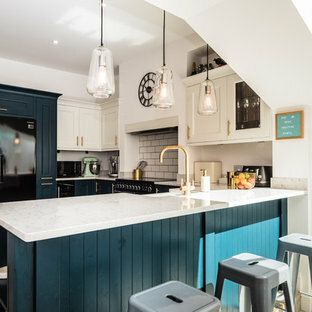 Our brief for this project was to transform the property which has seen many unsympathetic alterations over the years with a new internal layout, external renovation and interior design scheme to provide a timeless home for a young family. The property required extensive remodelling both internally and externally to create a home that our clients call their “forever home”. 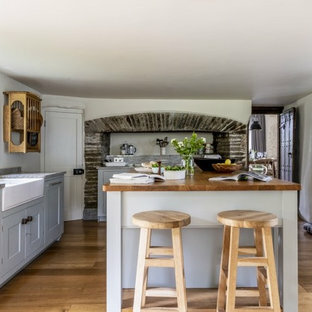 Our refurbishment retains and restores original features such as fireplaces and panelling while incorporating the client's personal tastes and lifestyle. More specifically a dramatic dining room, a hard working boot room and a study/DJ room were requested. The interior scheme gives a nod to the Georgian architecture while integrating the technology for today's living. 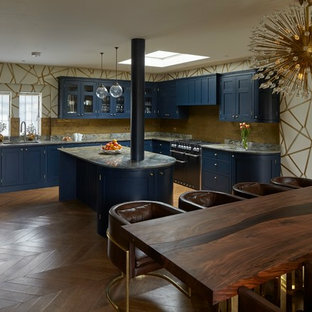 Generally throughout the house a limited materials and colour palette have been applied to give our client's the timeless, refined interior scheme they desired. Granite, reclaimed slate and washed walnut floorboards make up the key materials. 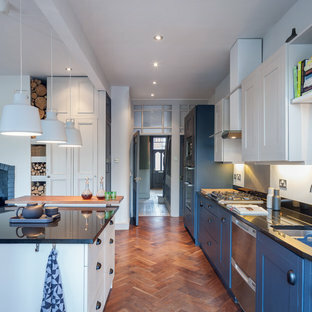 Incorporating part of a side return extension to a Victorian terraced townhouse in Fulham, this open plan contemporary Shaker kitchen was designed and made by Simon Taylor Furniture. 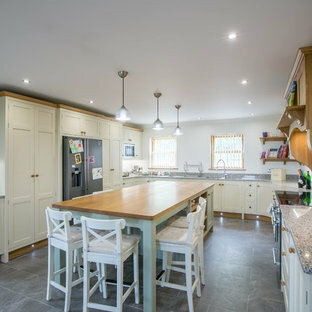 Designed as a contemporary take on a traditional Shaker kitchen, it features curved pilasters and rebated frames. 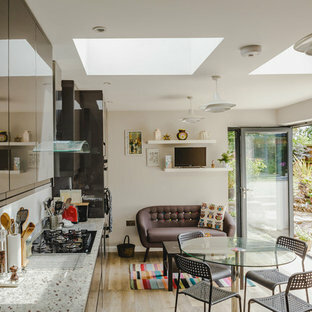 The open plan room extends outwards to incorporate a dining area together with an additional study and relaxation space, again with cabinets made by Simon Taylor Furniture. Located on the ground floor of the property, the room leads directly to the garden via glass bi-fold doors, making it vey light and airy. 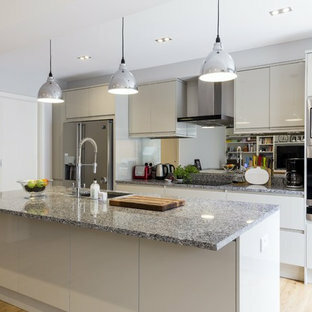 The kitchen, which is handpainted in French Grey by the Little Green Paint Company, features tall cabinetry with a pantry larder on one side to maximise storage space, with Miele larder fridge and freezer on either side. 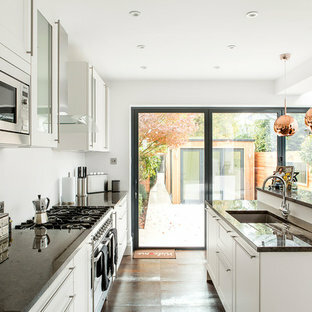 Opposite is the surface cooking area with a Miele induction hob and wall mounted Miele hood above. This is surrounded by wall mounted glass-fronted display cabinets to store glassware and crockery. Beneath the worktop is a run of pull-out drawers, again providing additional storage. 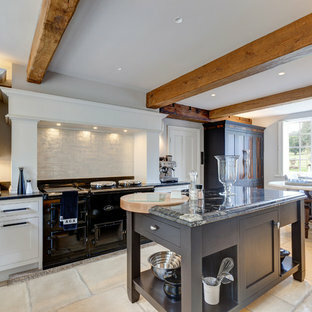 A further tall unit was created for dry goods and to house two Miele ovens side-by-side with a warming drawer beneath one of them. 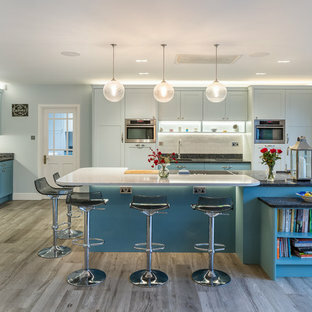 The central island was designed to be multifunctional with further cupboards beneath and with a Leathered Natural Basalt worktop that acts as the food preparation area with a sink by Kohler and tap by Franke. 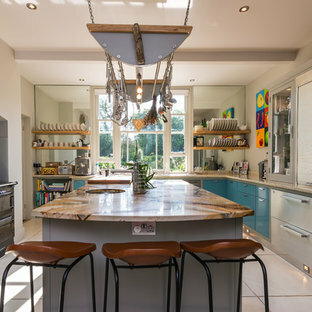 The worktop also features an overhang used as an informal dining area with low-level stools beneath. Integrated at one end of the island is an American Walnut bench seat to accompany a matching dining table and chairs.